At 5 p.m. Monday night, Mayor Heartwell's live interactive public access show City Connection was simulcast right here on The Rapidian. 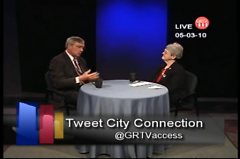 Co-hosted by GRTV's own Sr. Barbara Hansen, City Connection is an opportunity for Grand Rapidians to talk with our mayor about important city issues. City Connection serves residents who have any questions or anything they would like to say to Mayor Heartwell. Grand Rapidians are encouraged each month to do so on the article or by emailing [email protected], tweeting @GRTVaccess, or leaving a Facebook comment. Tune in on the first Monday of each month at 5 p.m. to hear him respond to you live on GRTV’s Livewire (channel 24 on Comcast) and streaming on The Rapidian.